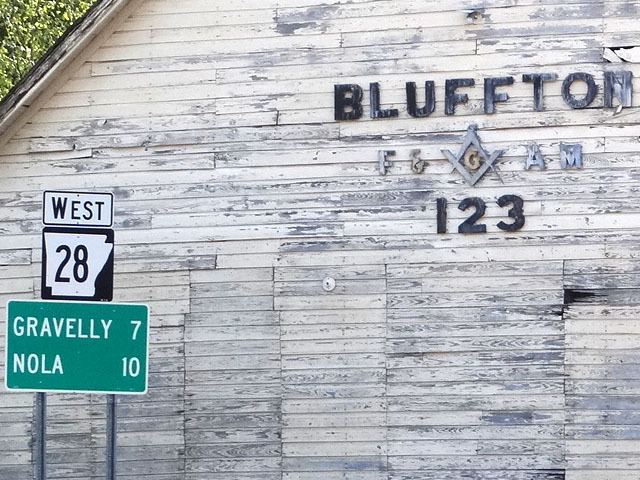 The direct route from Fort Smith, Arkansas to Hot Springs National Park takes you about 125 miles. In visiting a couple dozen post offices one steamy August day I managed to double that mileage, in no small part due to a 40-mile detour, two ways, to explore Route 28 between Rover and Waldron (read: visit four remote and possibly-to-close post offices). 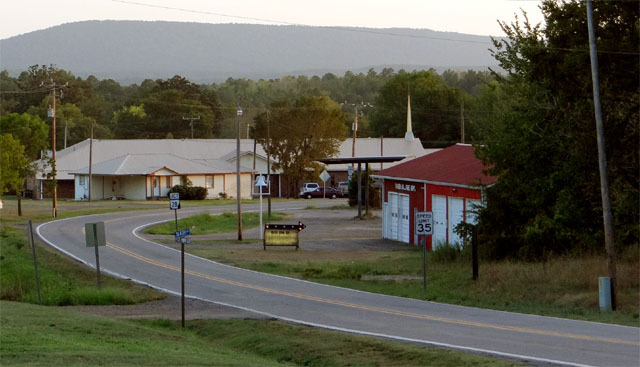 Here Arkansas Route 28 follows the Fourche La Fave River, which through the eons has helped to carve a winding valley between the Dutch Creek Mountain and Fourche Mountain Ridges and whose damming during the Great Depression led to the creation of the recreational Lake Nimrod south of Plainview. 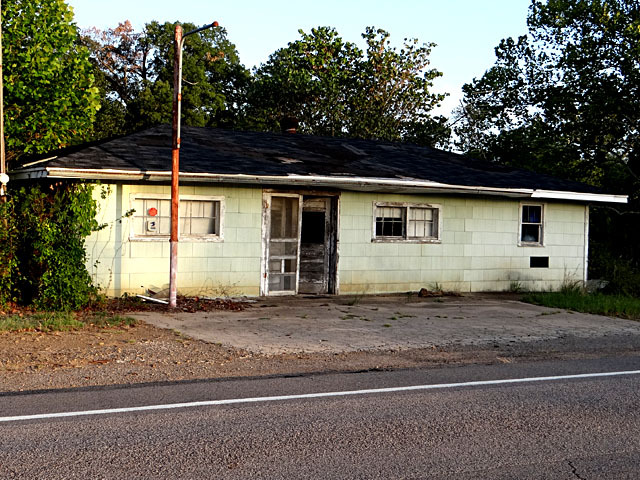 Today a trip along Route 28 reveals a handful of small communities, four active post offices and a couple of abandoned former postal sites that were evident to this passer-through. 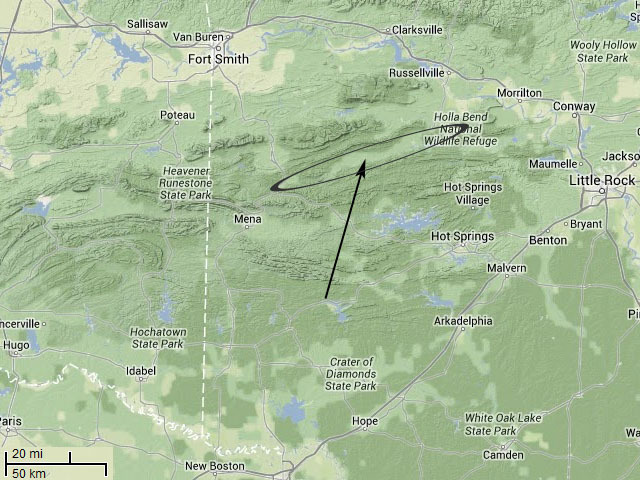 The valley (circled) is evident in this terrain map of western Arkansas. Observe that, generally speaking, the ridges of the ancient Ouachita (pronounced "Washitah") Mountains create a formidable barrier to major highway and city development in the region. William Least Heat-Moon explored and vividly described the area in the opening chapters of Roads to Quoz. As we progress further from the highwaters and toward the mouth of the Fourche La Fave River, our altitude will decrease accordingly. Parks is 646 feet above sea level. Harvey: 600 feet ASL. Gravelly: 463 feet. Bluffton and Briggsville: 440. Rover: 394. You wouldn't consciously observe this during your drive. The road is windy and hilly, and the view is largely tree-lined with occasional modest vistas. Starting from the east, I visited Parks last. 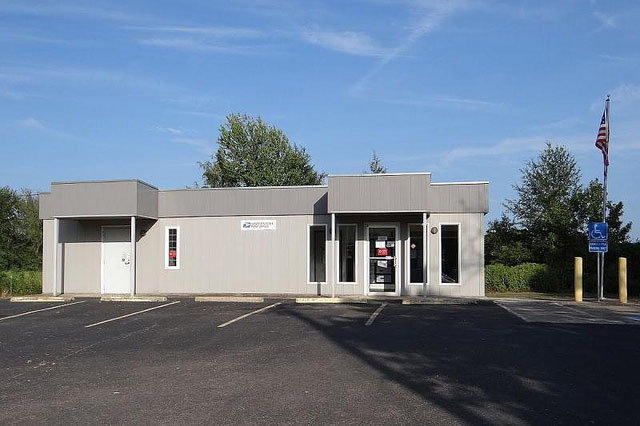 It also happens to be the only modestly interesting post office building in the area. Bluffton, Harvey, and Gravelly each received new bland-box structures in 1995 and 1996 (see USPS's Owned Facilities Report). 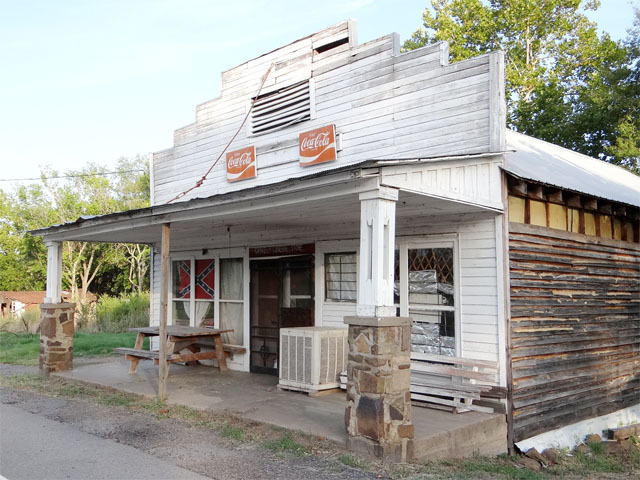 Parks is a dispersed community of about 400 people and its post office was first established in the surprisingly early year of 1838. (These dates come courtesy books published by La Posta.) There is no downtown to speak of; only a slightly concentrated cluster of buildings on Route 28. The same can be said for each of the other communities in this post, save Rover. 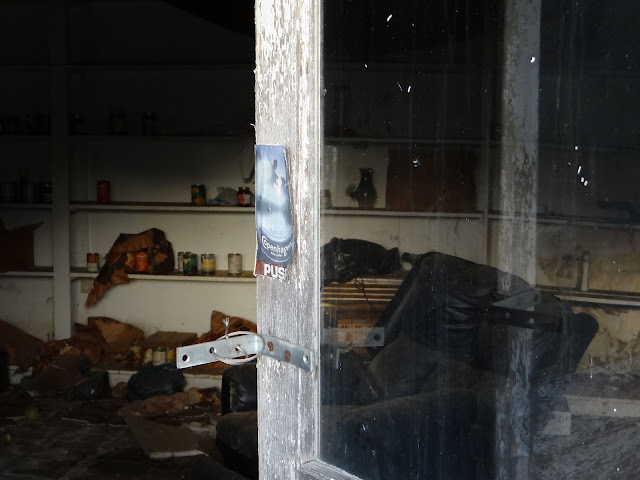 Parks does possess a Volunteer Fire Department, located in a building with no pavement and no tire tracks leading from its garage. 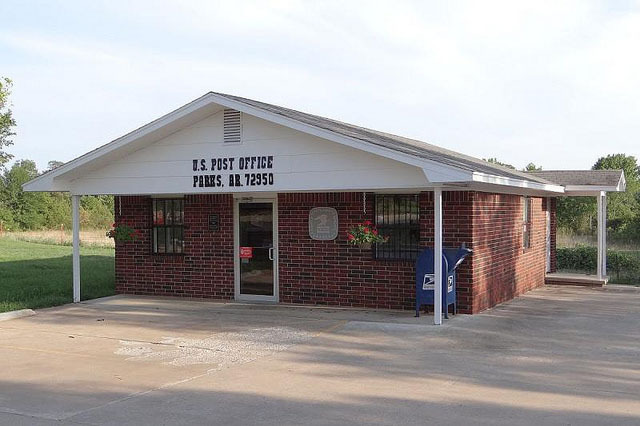 The Parks post office, which was the only commercial entity I noticed in town, has been located at its present site since 1991, the owner being a local resident with P.O. Box 5. 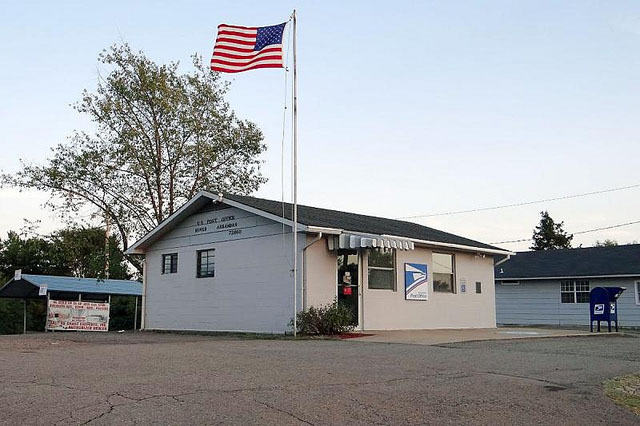 The lease was renewed during the frenzied heyday of RAOI during summer 2011, when it was very likely that more than 3,000 small-town post offices could have been closed by the end of the year. The current lease, for $5,100 per year, is in effect until 2016. 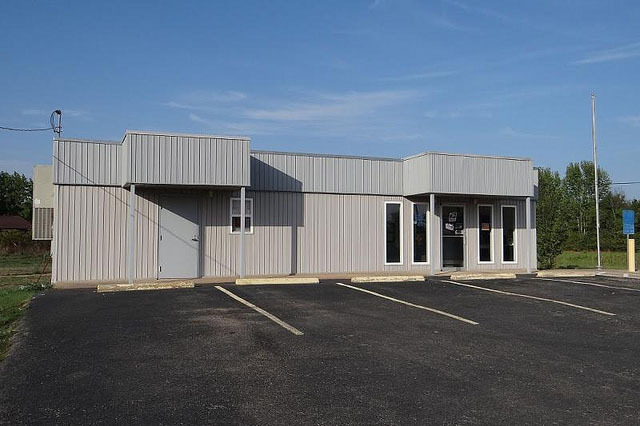 Unlike similar bland structures in many other parts of the country, what I call "Arkansas Modular" post offices feature modest roofs covering the customer and Postmaster entrances to the building. Very few offices have the name of the community on the building itself. Rather, they are granted a bland Sonic Eagle, either on the buildings themselves or on signs out front. Occasionally those bear the name of the community in some capacity. Harvey, the next post office east of Parks, possesses inch-tall lettering beneath the blue eagle on its sign. Harvey houses just shy of 200 souls, and its post office was established 1893. Next up is Gravelly's post office, which was established 1895. 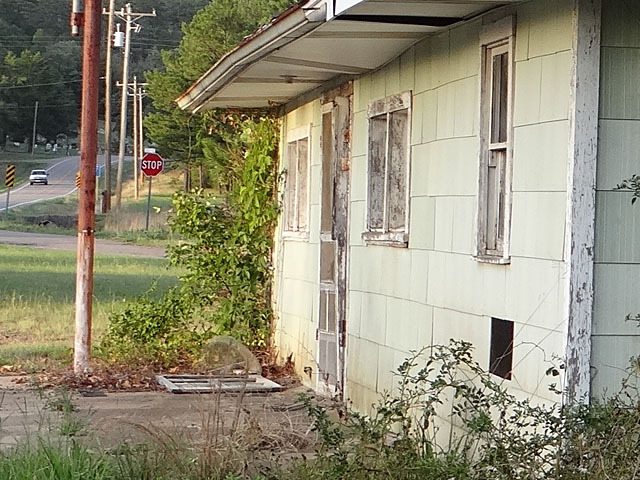 Gravelly's population is in the 100s, and its post office building bears no signage whatsoever. Gravelly possessed a general store, which I believe has since closed. Across the street was the former site of the post office, which is identifiable by its flagpole and the handicapped parking spot alongside the building. Why the building has a false front, I'll never know. 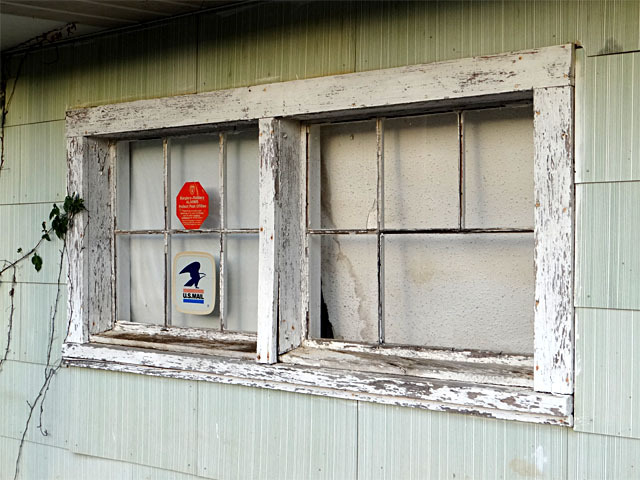 In case you forgot that you're in the South, you can find a couple of indications in the window of the general store. Driving through Briggsville I observed a small emblem in a window on a building along the road, leading to a short stop-and-reverse maneuver to the curiosity of the woman next door. She was friendly and chatty, although her name is lost to the now-non-functioning Notes application on my HTC smartphone. (Thank you, poorly executed firmware update.) [I believe it's her family that] owns what is now effectively a shed for scrap. 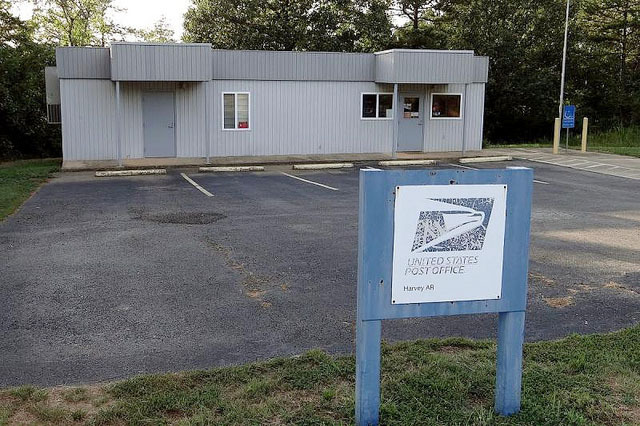 According to La Posta a post office operated in Briggsville from 1879 to 1974, though given the condition of the postal decals I wouldn't be surprised if the operation lasted into the '90s. The population of Briggsville is now 114. With about 500 residents Rover is the most developed community in the area, and it houses the local elementary and high school. The Rover post office was established 1854, has been at its present site since 1984 and (*gasp*) features the name of the community on the building! 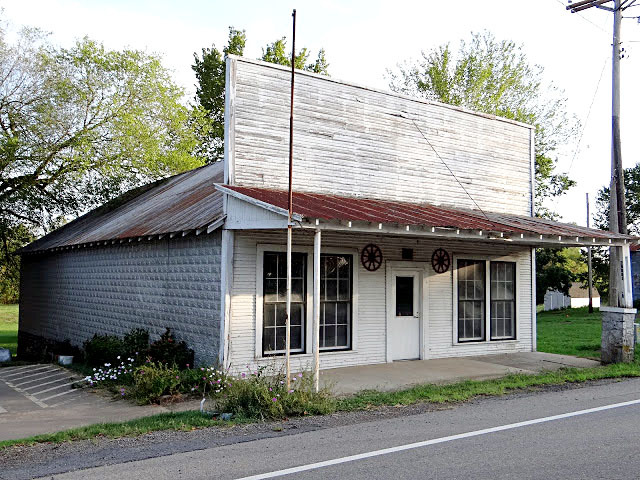 The post office is next to the (fully operational) general store. I arrived in Rover at sunset, and I'll leave you with a landscape photo taken from the post office parking lot.